House of dolls with 3 divisions. The house is unpainted or decorated so you can do it to your liking or simply leave it in natural wood and fill it with your accessories. Total Measure 47 x 17 x 49.5 cm. Interior hollow house 38.5 x 15 x 49.5 cm. Lyrics Poplar in 1 cm. perfect thickness to paint, ideal for decorating any space. Length 15 cm. 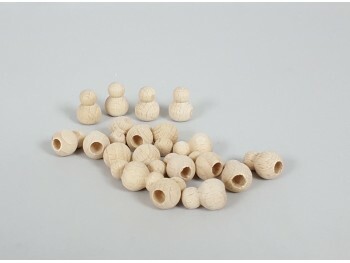 Small wooden dummy, perfect for keychain or as decoration. Measure 6 x 3 cm. Christmas tree into 2 pieces. Ideal for painting yourself. Measure 14 x 11 cm. Solid wood egg size Length 9 cm. 5 cm thick. 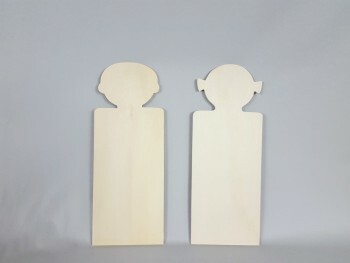 Poplar plate for the cut out door in the form of a boy and a girl. It is ideal for painting or naming. Measures 24.5 x 9.5 cm. Thickness 4 mm. Beaker for pens, pens made of beech wood, is lacquered to protect it from dirt. Measures 10.5 x 6 x 6 cm. 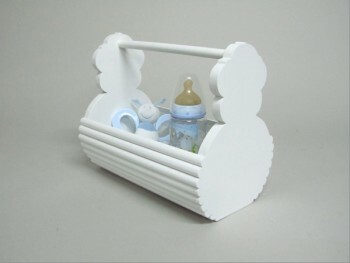 Wooden basket with the shape of a bear lacquered in white measurements 30x18x26 cm. 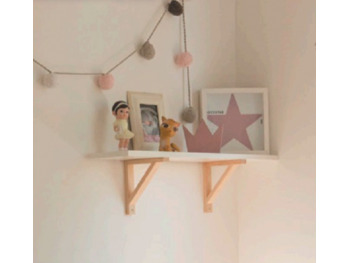 Ideal for a kid's room.